This is the second part of my January 14 blog in which we discussed sport watches that can measure vertical drop. I knew that GPS was a great tool for tracking someone’s travel, including time, distance and elevation and had considered buying a portable device for sometime. I had seen a few wrist versions, but found them too bulky to wear. During this past summer, I was introduced to the latest in personal GPS technology: Garmin, well-known for its navigation and communication devices had the perfect replacement for my aging Sunnto, and this past Christmas I received the ultimate ski-geek present, a Garmin Forerunner watch, that could precisely measure my skiing and provide me with lasting memories of my on-hill adventures. 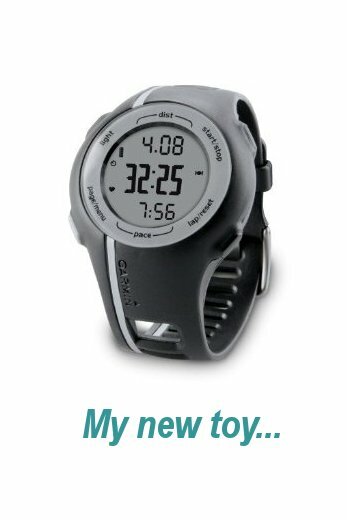 I should say that besides being a skier, I’m also a road runner, a mountain biker and a hiker, so this watch would be used in all of my other outdoors endeavors. Upon familiarizing myself with the new toy and installing the software, I tested it early January on my daily jogging course and discovered how easy it was to operate. Upon returning home, I just had to download the data on my computer before discovering in graphic details what I had done. Measuring my skiing would be the same and I couldn’t wait to testing it. This rather small watch only shows the time elapsed, the distance covered and the pace or speed per lap, while it’s worn; you must therefore download the complete data into a computer at the end of the day, and only then, do you get the full picture. To get started with recording a typical skiing day, you first need to get a satellite signal, then just pressing “start” gets you going and you don’t have to worry about anything until you take a break, have lunch or get to the end of the day. At that point, just pressing “stop” ends the recording session. As my next test was skiing at Deer Valley Resort, I choose to sample most of its ski runs. As I was ready to board Carpenter Express, I located the satellite, pressed the “start” button and was on my way to a three-and-a-half hour adventure that would take me to Empire Canyon, Bald Mountain and Deer Crest. When I returned home, I downloaded my ski day and could see right away that I had skied for 3 hour 28 minute, covered more than 36 miles (riding lifts and actual skiing,) reached a maximum speed of 47.2 mph near the base of the Deer Crest Gondola, skied a total vertical of 24,809 ft and reached an elevation of 9,553 ft at the top of Empire. Most telling however was the graph of my itinerary showing all the territory covered in just a few hours. Another interesting graph was the one showing the vertical drop for each one of the runs taken that illustrated multiple laps, and steep as well as flat sections encountered along the way. 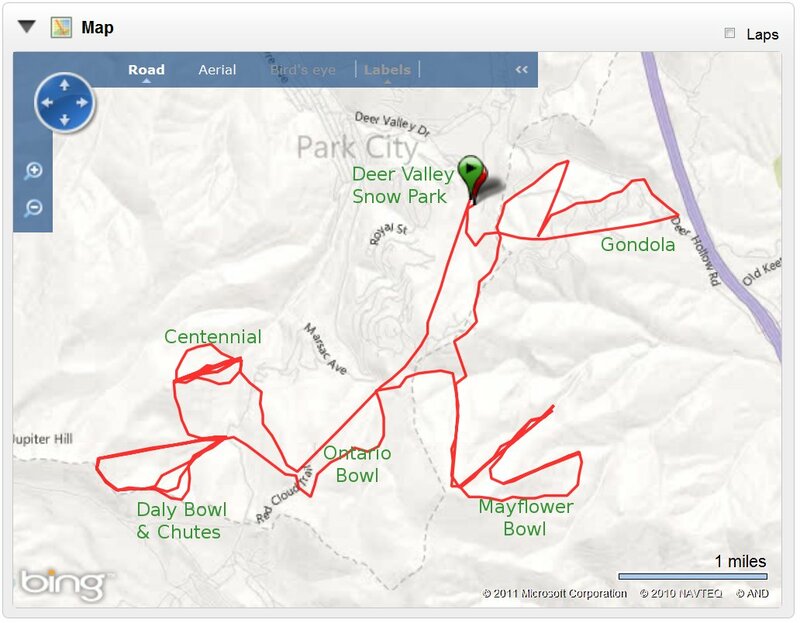 As an option, all this data can be put together in an animated format that shows the entire travel during the time my skiing was recorded. In that animated “Player” view, I can actually re-live my skiing in accelerated time, showing all the ups and downs and the choreography of time, distance, elevation and speed. 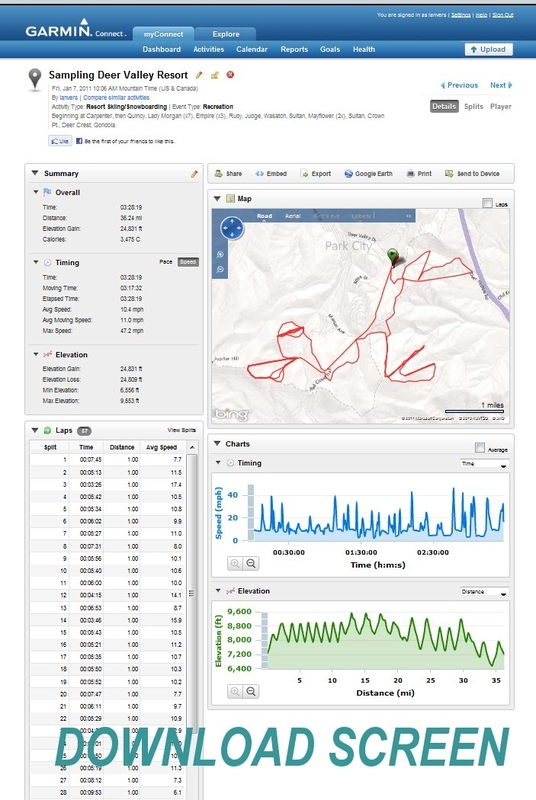 So with these results in hand, it’s impossible not to love this new Garmin. I plan to use it most of the time I ski Deer Valley this winter and do the same this summer when I ride my mountain bike or just go hiking. This by far is the best outdoors and fitness monitoring tool I’ve ever owned, and priced like a good quality watch, I don’t see why you should deprive yourself either! Finally, if some of your friends are equipped with other Garmin products that are ready for the special software, you’ll be able – if you so choose – to be seen by them and they may also share their on-snow exploits as well, making you all a very happy, busy and accountable family of skiers! What is the model of the Garmin Forerunner watch that you have. I have looked around and found a few different models.